As a Midwesterner growing up in the 60's and 70's, I recall thinking that fresh fruits, such as papaya, tangerines, pineapple and kiwi, seemed so tropical and exotic! Well, times have changed. These fruits are not only available year-round now but have become common items found in grocery stores. Now, thanks to our global markets and worldly customer expectations, we have increasingly more exotic fruits to explore in the grocery. Recently, I ventured out to a large local grocery store, an international market and a produce market here in Florida to see what exotic and unusual fruits I could find. I was surprised at what I found when I looked beyond the usual mounds of apples, bananas, and oranges. I purchased an assortment of six interesting fruits, and then I held an informal fruit tasting at two separate social events. Friends graciously tasted and commented on the fruits. As expected, those who have lived the longest in subtropical or tropical regions were familiar with many of the fruits. However, for most, this was the first time they had heard of or tasted these fruits. I have shared some of their ratings and comments below. When reviewing the tasting results, it confirmed what I have learned over the years after talking with people about their food preferences. What one person liked, another disliked for taste, texture or appearance. Click on the fruit name for images of the fruit. This fruit, from the cactus family, is grown in Florida, the Caribbean and other subtropical and tropical areas in the world. 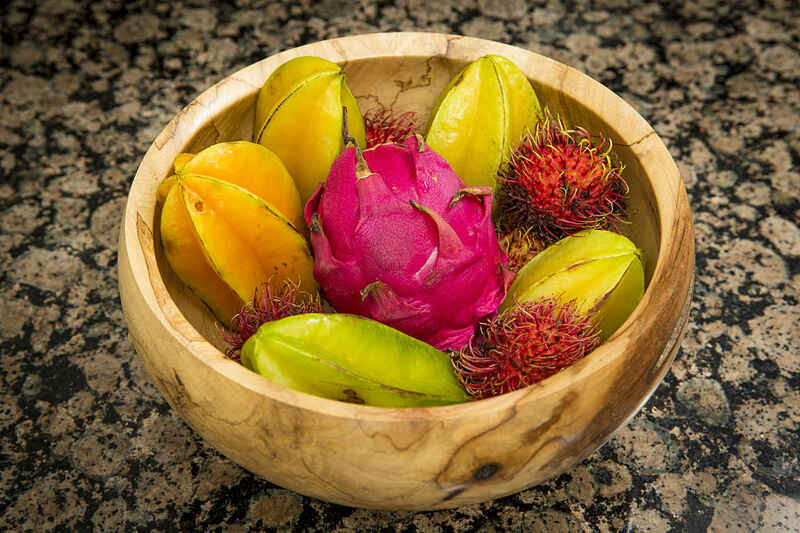 It is also called pitaya or pitahaya. It is very pretty on the outside and has a soft, pear-kiwi like flavor. You can slice it in half lengthwise to make a beautiful fruit bowl. Tasting results: average rating for taste, texture and appearance. Comments: Same texture as kiwi but less sweet. Looks better than it tastes. Pretty. Light and crunchy. Surprisingly good. Bland. This fruit may be round, oval or pear-shaped and is sweet and slightly acidic. The rind may range in color from white to red to purple. You can eat everything, including the seeds. It is an excellent source of vitamins A and C, fiber and potassium. More selection and storage information can be found at fruitsandveggiesmorematters.org. Comments: Nice smell. Seeds distract from sweet fruit. Seedy. Like the crunch of seeds. Pretty bland. Vegetable-like. Tastes like eggplant. Seeds were scary hard. This bright purple fruit is extremely sweet. It grows on a tropical evergreen tree in Florida and other subtropical and tropical areas. To open, make shallow cut around center of fruit, then twist to open. Eat segments right out of shell. Tasting results: average-high rating for taste, low-average rating for texture and appearance. Comments: Moderate flavor. Flowery and sweet. Looks like seafood. Very hard shell. Light taste. Strange appearance. Looks like slime. This aromatic fruit is native to Asia and resembles a large yellow pear. It is high in vitamins, minerals and is especially high in vitamin C.
Check out 10 ways to enjoy quince at fruitsandveggiesmorematters.org. Comments: Crunchy like a pear. A little tart. Hard like apple. Spunky. Dense texture that was still flavorful. Looked like an apple but did not taste as good. Tastes like dry pear. Dry and bitter. Dried mouth immediately. This tropical fruit is native to Southeast Asia. It is an interesting-looking, round fruit with hair-like spines. When ripe, it may be red, orange or yellow with green spines. It is commonly eaten like an orange after peeling the rind. Tasting results: high rating for taste, average for texture and appearance. Comments: Mild flavor, hint of apple. Strange-looking fruit. Off-putting appearance but tastes light and refreshing. Good taste. It is also known as Carambola. A sweet, yet tart, yellow fruit. It is grown in Florida and other subtropical and tropical areas. It makes a nice garnish or accent to fruit salad due to its star shape. You can eat the whole fruit with no need to peel or seed. It is an excellent source of vitamins A and C and fiber. Tasting results: High rating for taste, texture and appearance. Comments: Very pretty. Nice and juicy. Like texture more than taste. Lively. Like a medium-ripe watermelon. Delicious. Light, fresh taste. Tasty. As you can see, the prices I paid for the different fruits varied widely. If you are a frugal shopper like me, this may impact whether you buy it or not. I would also tune into seasonal and local availability to optimize taste, nutrition and overall quality of fruit. Ask the produce staff questions about selecting the right level of ripeness according to how and when you will eat the fruit. Exploring different fruits can be fun and interesting, which is one way to stay with a healthy nutrition plan. An informative website about these and other exotic fruits is SpecialtyProduce.com.